Observations on film art : Our new e-book on Christopher Nolan! Our new e-book on Christopher Nolan! Earlier I’ve described our site as a series of experiments in para-academic writing—a strategy for getting our ideas and research to film enthusiasts both inside and outside educational institutions. Once we had created the site and mounted essays and blog entries, we pushed on to other possibilities. Could we, we wondered, post published books that are out of print, making them free for anyone with access to the Web? Yes and yes. Could we create a print book out of blog entries? Thanks to the University of Chicago Press, we did. Could I post as an e-book a revised version of a published book, with expanded text and color stills? You bet! Could I post a new e-book based on blog entries? Done. Could we post our own video essays? Check and check. How about lectures in video form? Yup, yup. Today we launch another experiment. 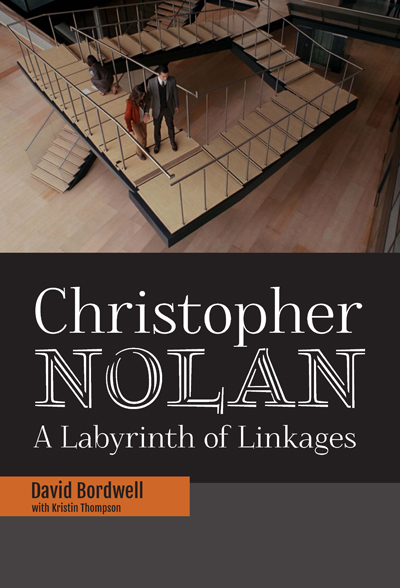 Christopher Nolan: A Labyrinth of Linkages is offered to you as an e-book. It revises, reorganizes, and expands on several earlier posts. What’s the new wrinkle? For the first time we offer film clips “baked into” the text. A version without extracts is also available. The cost for either one is $1.99. You can acquire either here, along with more information. What follows provides a little background on the project. Is Christopher Nolan a good filmmaker? A bad one? Good on some dimensions, bad on others? What about the faults and virtues of individual films? These are questions people consider typical of film criticism—questions turning on evaluation. Then there are questions of personal taste. Even if his films are good, do you dislike them? Even if they’re bad, do you enjoy them? Most people don’t distinguish between evaluation and taste, but I’ve argued before that this is an important distinction. Christopher Nolan: A Labyrinth of Linkages grants that along certain dimensions Nolan’s films can be faulted. By some criteria, his technique occasionally falters. Along other dimensions, the work is valuable. But the primary concern of the book isn’t to evaluate Nolan. Kristin and I want to analyze some ways in which his narratives have been innovative. Innovation isn’t inherently a good thing, of course, but we think that Nolan has fruitfully explored some fresh options in cinematic storytelling. Contrary to common opinion, we don’t think that the Dark Knight trilogy is a significant part of this tendency. We concentrate on Following, Memento, Insomnia, The Prestige, and especially Inception. We see in these films a consistent inquiry into how multiple time frames and embedded plotlines can be orchestrated in fresh and engaging ways. The key problem is comprehensible complexity: How do you build more elaborate structures and still not lose your audience? How do you design a labyrinth that contains enough linkages to guide your viewer toward a unified experience? This is a problem that confronts any filmmaker who tries for ambitious storytelling within the tradition of mainstream American cinema. So if one of your criteria for a good film is adventurous novelty, then there is a case to be made for Nolan. But maybe you don’t accept that criterion, or you resist the claim that he’s doing something intelligent with classical plot structures, or maybe his work just isn’t to your liking. Nonetheless, we hope that our analyses will shed light on his films—and more generally, on other films. One of the goals of all our research, online and off, is to trace out broad tendencies. We’re interested in disclosing creative options that are available to filmmakers working in different traditions and at different points in film history. Other directors or screenwriters can push Nolan’s experiments in other directions. And we can study all these options and pathways while suspending evaluation and personal taste. Christopher Nolan: A Labyrinth of Linkages sticks to some of the rules I outlined with respect to Pandora’s Digital Box: Films, Files, and the Future of Movies. The original blog entries aren’t taken down. All the original blog entries will remain available online. To see them, click on the Nolan category on the right. The book isn’t simply a blog sandwich. One reason I created this book was to revise and reorganize the somewhat diffuse blog posts into something tighter, with a smoother flow of ideas. The book has substantial new material. Some points in the original posts are expanded, while we add some fresh ideas about Nolan’s significance. It isn’t an academic book. It’s written in the conversational style of our blogs. Nonetheless, the text and a reference section in the back provide links to documents, interviews, sources, and sites of interest. The book isn’t free… Again, I’ve had to pay for design and work on the video clips. So my hope is to recoup my expenses and even pay myself something for my effort. …but it’s very, very cheap. Planet Hong Kong 2.0 runs $15, which I think is a fair price given the cost of designing a long book with hundreds of color pictures. Pandora is a lot simpler and has only a few stills, so it costs $3.99. The Nolan book, quite a bit shorter than Pandora but with many stills and several video extracts, is priced at $1.99. And there will be video. One version of the book contains six short extracts from films that are analyzed. These are “baked in.” That is, you don’t have to be online to watch them. So now, some specifics. These are also reviewed on the purchase page. We offer a vanilla version of Christopher Nolan: A Labyrinth of Linkages that is a pdf file of 10 MB. It contains lots of stills but no clips. It will display well on any computer or tablet. It costs $1.99. The audiovisual version of the book is a much fatter pdf file, nearly 300 MB. That one will take longer to download, of course, but it will enable you to play the clips anywhere, whether you’re online or not. It too costs $1.99. All the clips play smoothly on laptops and desktops, whether PC or Mac. As far as we know, Android-based tablets will run the clips organically. Still, some operating systems on some devices may not natively display the videos. Most notably, the Adobe PDF Reader on the iPad will not run the clips. But there is at least one iOS-friendly application available, PDF Expert, that will play the clips. Probably other apps exist or will be developed. You may want to experiment for best results. Payment procedure is via PayPal, funneled through PayHip. PayHip enables us to put a big e-book file on the Cloud. When you make your purchase, you will be directed back to the PayHip site to download the book. An email will also be sent to the address you provided, with a download link. Once more, you can go here to order the book. On the same page you can examine the Table of Contents. As I said back in 2012 when we introduced Pandora: If you decide to buy the book, we thank you. And again we quote Jack Ryan from the end of The Hunt for Red October: Welcome to the new world. Thanks to our Web tsarina Meg Hamel, who did her usual superb job turning the Nolan blogs into this little book, and who has set up the payment process to be quick and easy. Thanks as well to Erik Gunneson for his work preparing the clips for our analyses. All illustrations in this entry from The Prestige. This entry was posted on Wednesday | October 30, 2013 at 8:38 am	and is filed under Books, Directors: Nolan, Narrative strategies. Responses are currently closed, but you can trackback from your own site.